Automatic transfer switch, 50A 120/240V relay based with terminal strip. The LPT50BRD is intended for use as an electrical transfer switch to automatically switch multiple sources (from one to another), i.e. switching from shoreline to generator power. The LPT50BRD is primarily designed for installation in conjunction with a generator having a rated output of no more than 12KW and an external power cord having a rated output of no more than 240VAC 1PH 60HZ, 2 poles at 50 Amps per pole. 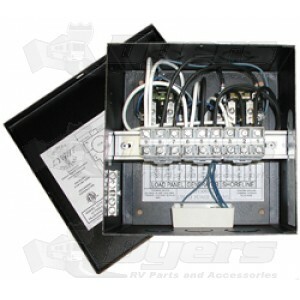 CONTACTORS: General Purpose DPDT 50 Amp relays. COIL: 110 VDC 2 Watts. 240VAC 1PH 60HZ, 2 poles at 50 Amps per pole. 240 VAC, 4 Poles, 50 Amps per pole. Enclosure: 8-1/2" x 8-1/2" x 4-1/2". I have a Tiffen Allegro 31D with two air conditioners. I fried my original transfer switch when I ran both air conditioners off a 30 amp connection at a park. Bad idea- my fault. Replaced that with a TRC Surgeguard. The TRC had the constant AC buzzing noise and it drove me crazy with the transfer switch right under the bedroom (although it did get better over time). I thought about replacing it, but then the TRC circuit board cooked itself and made the decision for me (this time not my fault- connected to shore power and sitting in storage). Replaced it with this unit. Install was simple to install, lots of knockouts for running wires into the box and lots of different sizes, unit is very durable, it switches just like I would expect it to, and the switch uses DC so THERE IS NO MORE NOISE! Very happy with the unit. It doesn't have surge protection but I can install that downstream.